As I mentioned in my last post, this trip is not a vacation (otherwise, a mere towel might be sufficient). The Phoenix Islands Expedition is an exciting scientific opportunity for 15-team-members to document, explore, and measure underwater life in a place without local anthropogenic impacts. Since most of the islands are uninhabited, and the PIPA Marine Protected Area is now the largest in the world*, there is very little (if any) local impact by humans. In other words, there is no tourism, only artisinal fishing (if any). There is no local or point-source pollution, no dynamite fishing, etc. While these islands probably experienced major human impact in the 1930s and 1940s when the Phoenix Islands were a strategically important military base, the Phoenix Islands have been mostly left alone for the past 50+ years. Thus, they are now one of the most remote (and among the healthiest) coral reefs on the planet. 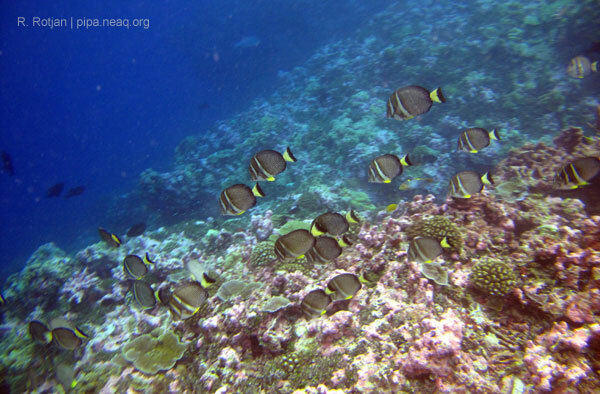 However, no reef is immune to global change (after all, global change is ... global!). Thus, studying the Phoenix Islands is an opportunity to isolate local versus global human impacts on reefs. Almost anywhere else on earth, global and local impacts are mixed together, and scientists can't separate one from the other! But here, we will be able to look at global impacts with very little (if any) local influence. 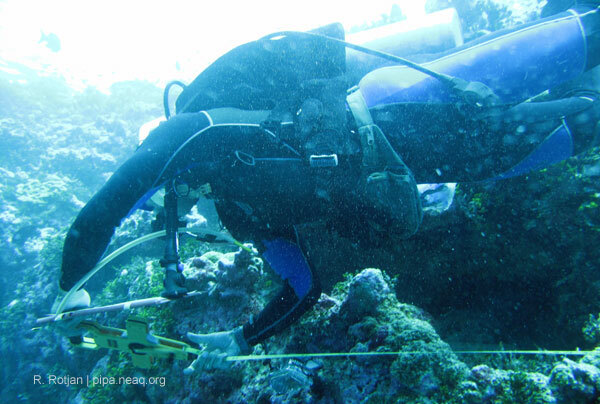 Thus, our goal for the trip is to examine a reef exempt from local human impact. To do this, we will do lots of sampling (to look at proteomics, transcriptomics, population genetics, disease, reproductive success, bacterial communities, etc). But we will also run lots of transects, and examine lots of quadrats (see a photo example from Hawaii below), where we count the number and status of fishes and corals along a given distance. Finally, we will set up some field experiments to determine how fishes and corals behave with no direct human influence. There are some other projects too--some team members will be sampling for plankton. Others will be sampling for worms, mollusks or sea cucumbers ... coral reefs are among the most diverse ecosystems on Earth, so there are lots of animals to study! The Phoenix Islands are a special kind of coral reef formation: they are atolls. Basically, atolls are sunken islands (initially formed as volcanoes) where only the perimeter remains--so that an island of coral persists surrounding a lagoon (a sheltered, shallow area). Because of this special formation, there are also completely submerged seamounts that are similar to atolls, only no corals "crest" above the surface. One of the other missions of this trip is to explore these seamounts shallowly, and using an ROV to examine the sea life at depth. As you can see, we have a lot to do! We only have 12 days on-site (the rest of the time will be spent traveling to and from Fiji), so we'll be busy working and diving to accomplish these goals. Yes, working 24/7 on remote tropical islands is our crazy idea of "fun." I'm really excited to post our discoveries and our daily adventures on this blog; these sorts of trips are the perfect mix of intense work and intense fun. Every day will bring new surprises, I'm sure. Fortunately, we also have some amazing team members who are professional photographers and videographers who can help us document what we see so that we can share our findings with all of you. So, my mission is clear: learn as much as I can (along with my colleagues) in 12 days about a coral reef in the absence of local human influence. Your mission, should you choose to accept it, is to virtually join us. Post your thoughts, comments, and questions! Live blue! Be curious and critical! And check out the Phoenix Islands on our Live Blue Initiative to see where we're going! *Since this post was published, larger marine protected areas have been established. However, PIPA still remains one of the world's largest.